Abstract: With its bright red PCB, and yellow IDE-RAID ports glaring at us we removed the MSI 845 Ultra from its box in record time and in went a 2.0 GHz Pentium 4 with an Arkua 8568 sitting on top. AMD knew it had a good thing coming when it first jumped on DDR, and of course Intel shortly followed suit with its i845D chipset. The i845D is brother or perhaps, stronger brother to that of the i845 which only used SDRAM. The difference between the two chipsets, which already have a steady amount of competition is slight but very significant. While the i845 brought the Pentium 4 (socket 423 and 478) into the waiting hands of the well established SDRAM, it didn't produce high performance systems. The i845D came onto the scene ahead of schedule to the delight of all Intel watchers and ushered in with it support for DDR memory. With its bright red PCB, and yellow IDE-RAID ports glaring at us we removed the MSI 845 Ultra from its box in record time and in went a 2.0 GHz Pentium 4 with an Arkua 8568 (copper core) sitting on top. We've always like MSI boards because they generally offer very good overclockability and so it will be interesting to see just how high we can pump up the 845 Ultra-ARU. In addition to its on board IDE RAID via the ATA133 Promise PDC20276 controller, and support for up to 2GB PC2100/PC1600 DDR the MSI 845 Ultra also supports four integrated USB2.0 ports thanks to a small NEC BGA by the CNR. 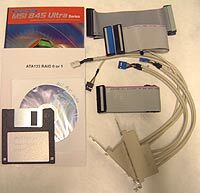 As we all know, when the Pentium 4 was first released, it was only able to with RDRAM because RDRAM at the time was the only form of memory that could deliver enough bandwidth to keep the Pentium 4 happy. 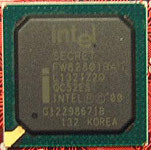 A few months later, Intel would release the original i845 chipset which allowed the P4 to be used with SDRAM. While it would seem Intel was being counter productive by releasing a SDRAM chipset for the Pentium 4, the reason was RDRAM's very high price scared most of the buyers away. Even now, with DDRAM prices steadily increasing, the SDRAM capable i845 chipset is looking good to some buyers intent on coupling it with inexpensive SDRAM... once again. When it comes to chipsets that support DDR you have essentially three real options; the i845-D from Intel, the SiS645 or the VIA P4X266A. MSI have chosen to use the i845-D on the 845 Ultra-ARU because of Intel's long reputation of producing solid, stable and well performing chipsets. We were pleased with the general layout of the board, one 1.5V 4X AGP port and five 32Bit PCI slots offer users lots of room for expansion. The CNR slot at the base of the 845 Ultra isn't really that useful for the average consumer, but corporate markets can take advantage of it by using less expensive CNR devices. On board audio comes thanks to the C-Media 8738 5.1 chipset which brings PCI-6ch support for 2/4/6 channels of audio to the table. 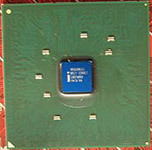 As you can see, the i845-D uses flip chip technology (FC-BGA), it even looks a lot like a Pentium III! Even though the i845-D doesn't produce a lot of heat, MSI has taken the liberty of putting an active heatsink on the northbridge. The i845-D chipset supports a total of 2GB of PC1600/2100 DDR RAM and even though the reference Intel i845-D board only calls for 2 DIMM slots, MSI can get away with having 3 DIMM slots (supporting four memory banks). The 82801 ICH2 (I/O Controller Hub 2) has been around for quite some time now, debuting when the i810E and i815E chipsets came out approximately 1-1/2 years ago. That's an eternity for technology, but that also means it has proven itself. 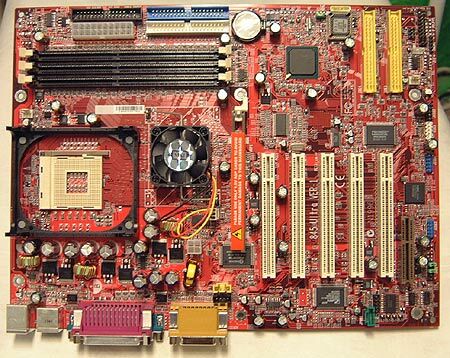 I expect the days of this southbridge are numbered, as the 64bit PCI slots and PCI-X are just around the corner. The MSI 845 Ultra has 4 USB 1.1 ports - two on the board, two on a riser card and the southbridge natively supports up to 4 IDE devices.